When Charles moves with his parents to a spooky old building in Echo City, he's not exactly thrilled to learn the place has a monster problem. But when he meets a mediator who deals with turf beefs between monsters and kids, he's not sure which is more intimidating: the monsters or Margo Maloo. 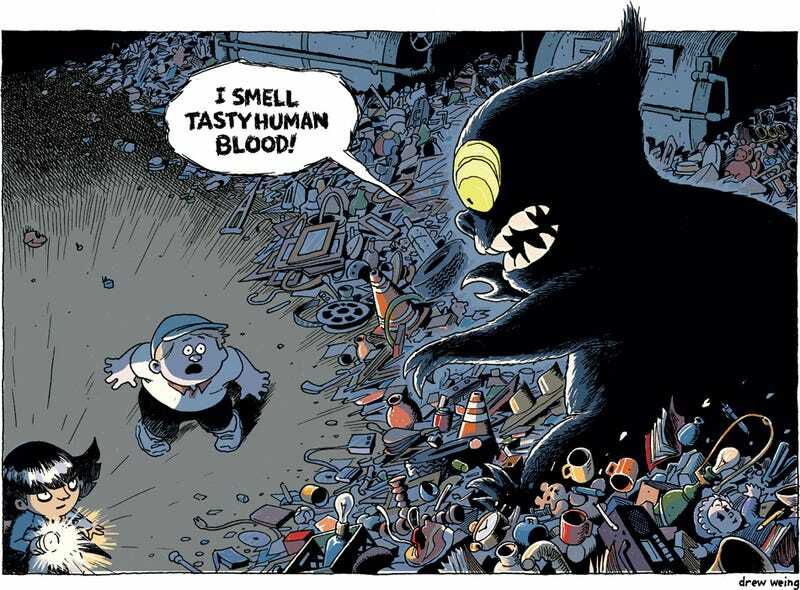 Drew Weing's The Creepy Casefiles of Margo Maloo is one of those comics that instantly feels ripe for an animated series. Charles' father is hired to renovate a strange old apartment complex, and Charles is feeling rather grumpy about the whole thing. After all, he just left his home and all his friends—and he's pretty sure he's going to get mugged in Echo City. Charles, who also happens to be an aspiring journalist, is immediately fascinated—and not just by the monsters. Who is this Margo Maloo character? Why doesn't she want any adults to learn that monsters exist? Could she be in league with the monsters, or perhaps even a monster herself? Charles is determined to find out, and we get to watch Margo's strange and funny investigations along the way.